We are now accepting applications to join our editorial board for the upcoming academic year. Members of our board meet weekly to discuss submissions to our magazine, plan events and fundraisers, brainstorm blog pitches, and more. The Columbia Review is the oldest college literary magazine in the country, and has published the likes of John Ashbery, William Carlos Williams, Allen Ginsberg, and more. We are dedicated to building a stronger literary community here on campus by hosting open mic nights, readings with established authors, parties, workshops, potlucks, and more. If you’re looking to make literature a bigger part of your time here at Columbia, or want to help foster a stronger literary community on our campus, we encourage you to apply. Applications are open to all undergraduate students from all four schools within Columbia University (CC, BC, SEAS, GS), regardless of age or major. The deadline for applications is Wednesday September 16th, 2015 at 11:59 P.M. 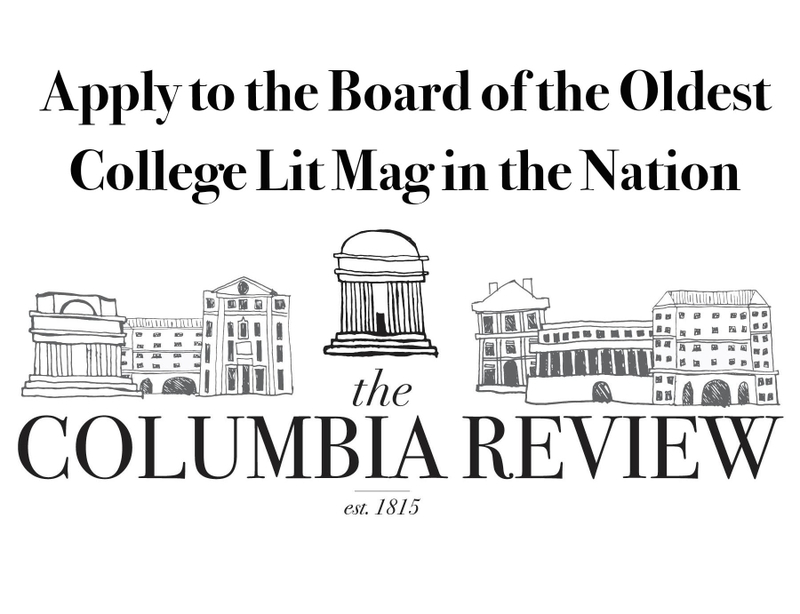 If you have any questions about the application, or the magazine in general, please send us an email at TheColumbiaReview@gmail.com. We look forward to reading your application.